Radiohead and Conan O’Brien have always had a connection. If you didn’t know, Radiohead was the very first musical guest on Conan’s show back in 1993, which was also the band’s first TV appearance in the US. So, it’s no surprise to hear that Conan covered “Creep” during his soundcheck in Eugene, Oregon. 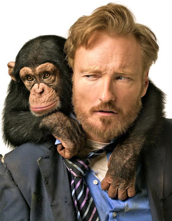 Conan’s currently touring his comedy show, The Legally Prohibited From Being Funny on Television Tour. Radiohead – Creep (Conan O’Brien 1993) from Guillermo Delicia on Vimeo.